Here we have the final piece of the puzzle, in which the Marvel of old can fully be said to have transitioned to that of the new. We've seen how the Marvel superhero comics grew out of the '50s craze for monster stories, before quickly establishing a footing for themselves. And in recent months we've seen the elimination of "filler" material of the sort that used to dominate: One-off short stories featuring characters and situations which didn't return. 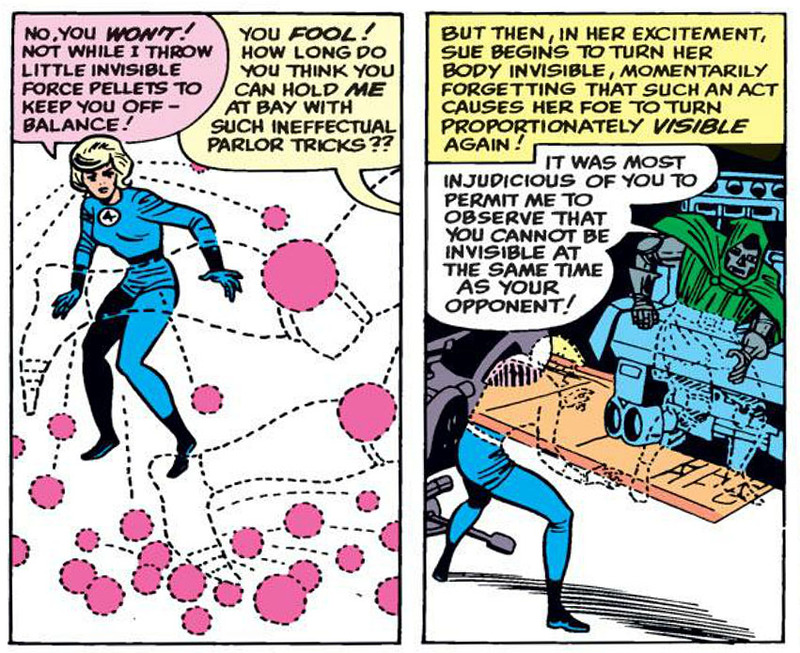 (Indeed, we can theorize that the "Tales of the Watcher" and "The Wonderful Wasp Tells a Tale" backup strips might have been devised as ways to burn off unused inventory, as the Watcher and the Wasp were usually used - at first - only as framing segments.) The final move was begun last month, as the Hulk guest-starred in Giant-Man's story in Tales to Astonish, as a seamless lead-in to the following issue in which the two characters would begin sharing the book for the foreseeable future. 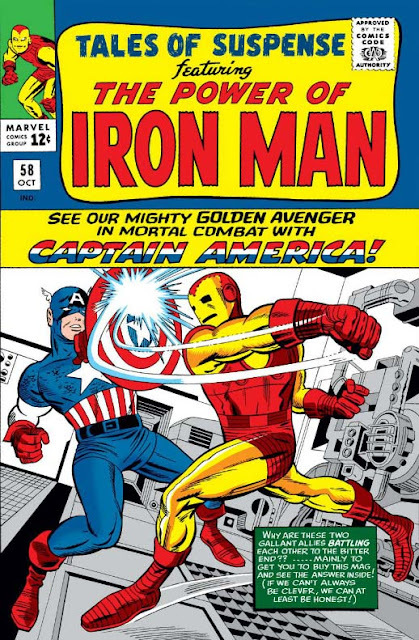 Here the same thing occurs, as Captain America guest stars in Iron Man's regular feature; next issue, the title will likewise become a split-comic with each hero getting half the book. This will last until 1968, when Captain America will claim the book entirely, kicking Iron Man out to get a full-length mag of his own. Of historical note is the fact that when Cap's new strip starts next month, it will be the first solo series Cap has had since his very brief revival attempt during Marvel's "Atlas Era" in the 1950s, and which lasted a mere three issues. This time, though, will be much more successful, and his adventures have run continuously ever since. 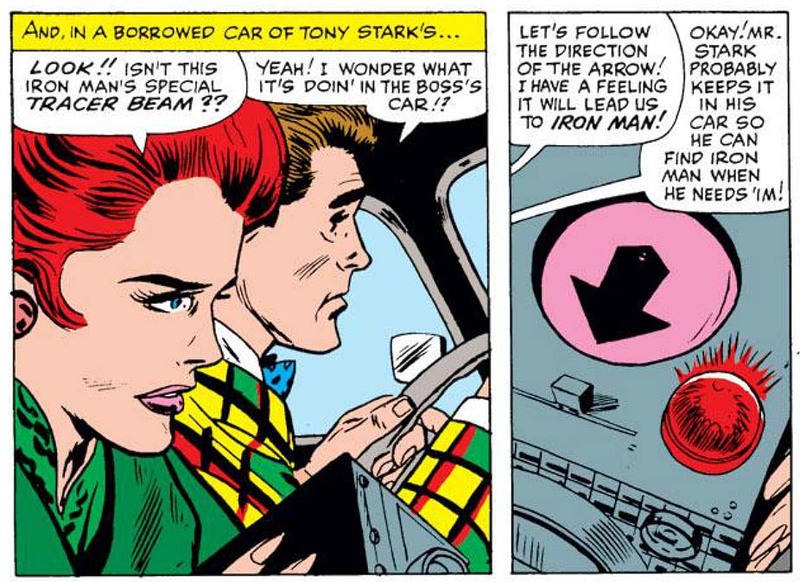 Iron Man tracer in Iron Man's car? While the format change is taking the approach utilized by Tales to Astonish as its cue (the two characters fight one issue, then split-book the next), the result is sadly far less successful. Whereas the Hulk / Giant-Man tale was an astonishingly impressive example of a "stealth pilot", elegantly conveying to the reader everything he or she might need to know about the Hulk's origin, supporting characters and general milieu in the course of the story, the same can't be said here. 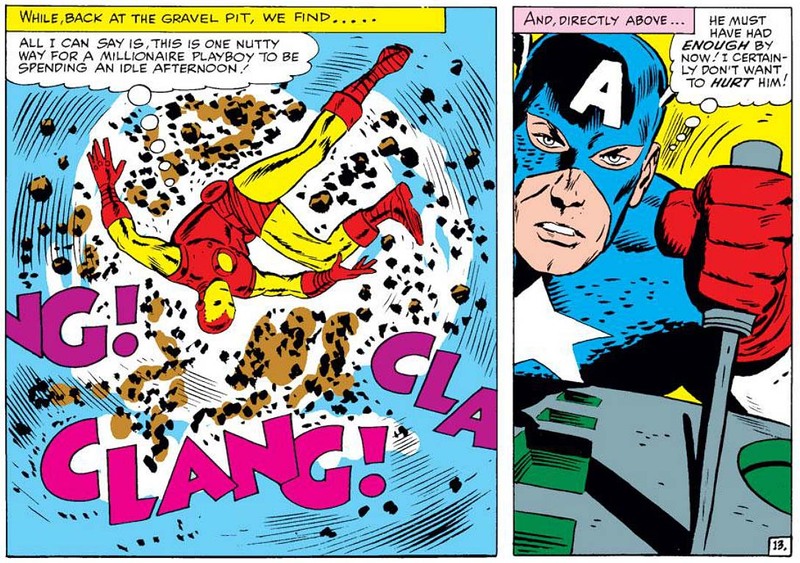 Instead, Cap shows up as Iron Man's Avengers teammate, and someone for Iron Man to fight ... and that's it. Sure, maybe the reason we're not treated to Cap's supporting characters and setting is because he - as of yet- doesn't really have any, but it's still undeniable that his appearance here is simply that of a random guest-star in an Iron Man yarn (whose function could have been filled by anyone) ... as opposed to the TTA tale, which really did read as a Hulk story just as much as a Giant-Man one. The rest of the story is no less frustrating; for instance, face-changing Spider-Man foe The Chameleon may be a decently clever way to get two heroes to fight each other via mischief and confusion, but it's harder to see why Stan had The Chameleon return to the American shores in the company of Kraven the Hunter - who is defeated in the space of two pages, and not seen again. The rest of the comic is then hampered by case after case of "idiot plotting", that unfortunate example of lazy writing where a simple misunderstanding could be cleared up in ten seconds by the characters talking to each other, rather than by fighting or otherwise overreacting. It's probably not the worst Marvel tale we've come across thus far ... but it might be in the bottom ten. Captain America seems oddly off-model, doesn't he? Still: Let's talk about the coming changes! Because if Captain America is going to be taking over the other half of Iron Man's book, then that surely means the "Tales of the Watcher" must end. (Although the feature will return, briefly, as a backup strip in 1968's Silver Surfer.) And so we receive the final tale, "The Watcher Must Die!" 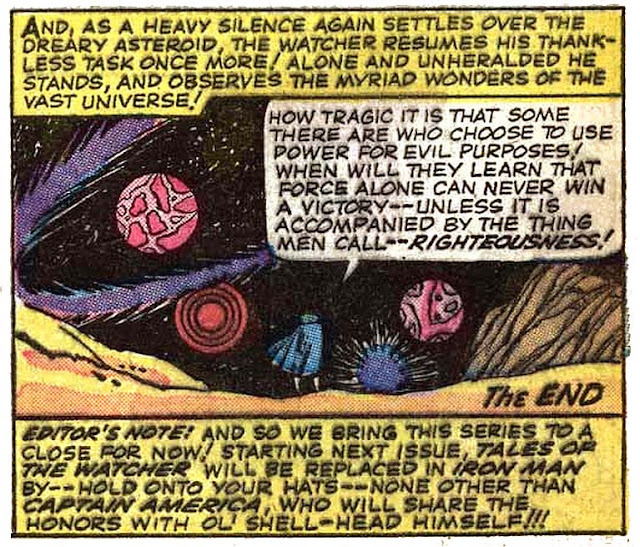 From that title, I had hoped we might get a story purporting to show the Watcher actually dying / transcending / whatever, even temporarily: a fitting sendoff to the backup strip, and an acknowledgement that its time had now passed. Instead, what we get is the Watcher's planetoid being invaded for the third time in the last four issues. (If this plot is all that could be conceived for the character, perhaps it was indeed time to retire the strip.) This time, instead of providing the readers with a shocking twist like the kind seen last issue, the Watcher instead defeats his enemy by speeding up time in the area around him, and watching him die. Not only does this display near-godlike abilities on a level I'm not sure we'd previously seen ... but it's also not that far distant from the "cosmic filibuster" seen in issue #55. It's just that this time the "wait him out" approach hinges on near-magical powers, rather than a genuinely clever ploy. to convey the sequence of events. And as we say farewell to "Tales of the Watcher", having already seen the final Wasp strip, so too do we see the last of Larry Lieber's monthly backup features. (Surprisingly, his final tale was last month, as this outgoing story is by Stan Lee - and not altogether better for it!) More than one reader of this blog previously took me to task for being perhaps unduly harsh on Larry's writing in the early Ant-Man stories, but I really took a shine to his work on these later backup strips - and it's safe to say that he enjoyed them far more as well! We've not seen the very last of his pen in the Marvel U - he'll continue to put in the occasional appearance, from time to time - but for the most part, he'll be much happier from here on out toiling in the realm of cowboys and gunslingers. Coincidentally enough, while this last tale signals the departure of one voice, it also sees the introduction of another ... as Golden Age artist George Tuska here returns after several years away, going on to become a Marvel mainstay for many years to come. All-Doom Special! Yes, this second annual for The Fantastic Four is packed with superhero goodness. But what, might you ask, do the "72 BIG PAGES" shouted on the cover contain? Well, first it starts off with a 12-page origin of Doctor Doom - expanding greatly on the half-page seen in Doom's first appearance - before then getting the now-traditional (see here, and here) gallery of full-page dossiers of their newest foes, from #18 through #30: The Super Skrull, Pharaoh Rama-Tut, the Molecule Man, the Hate Monger, the Infant Terrible and Diablo (6 pages in all). A reprint of Doom's debut in Fantastic Four #5 follows (23 pages), along with 5 pages of pin-ups (one for each of the Fantastic Four, and Alicia). Rounding things off is a new Fantastic Four story clocking in at 25 pages - which means that the "double length epic" billed on the cover is a blatant lie. If you've added all these up, however, you've noticed that this only accounts for seventy-one pages. What's the other? Simply a Marvel house ad for the two other annuals on the stand that summer! From the lost pages of Grimm's Fairy Tales? Doom's origin story actually has a very fairy-tale quality to it, beginning when he was but a young boy, the son of a gypsy healer in the Bavarian Alps. When the local baron's wife falls deathly ill, he has his men take the older Von Doom by force, demanding that he save her with his healing arts - or else. Von Doom is unable to do so, however - she's simply too far gone - and he is thus hounded through the woods, doing whatever he can to protect his boy, and eventually dying from the strain. The young Victor Von Doom swears vengeance, of course, so it rather dovetails nicely when he discovers that his dead mother had been a sorceress, and he finds a strange chest containing all manner of magical artifacts and paraphernalia. Using these magics and his own mechanical genius (learned from where, we might ask? ), he soon begins a campaign of swindling the upper class through a variety of tricks and potions, nobly giving all his ill-gotten gains to the poor. Yes, as incredible as it might seem, Doctor Doom first began as a strange sort of Robin Hood, waging class warfare against the aristocracy! Marvel continue to be unable to spell "pharaoh"
Before long, we're told, Doom's numerous inventions bring him to the American attentions of State University, who offer him a scholarship on the spot. There he meets - and instantly rebuffs - a young Reed Richards, who instead becomes fast friends with football star Ben Grimm. One day, Reed stops in at Doom's dorm room while he's out, and reads over Doom's notes about his newest invention, having to do with "matter transmutation and dimension warps" - all culminating, in fact, in an attempt to "contact the nether world". (Later stories would expand this into his first of many attempts to contact his dead sorceress mother, giving this portion of his origin story a personal, driving motivation it here lacks.) 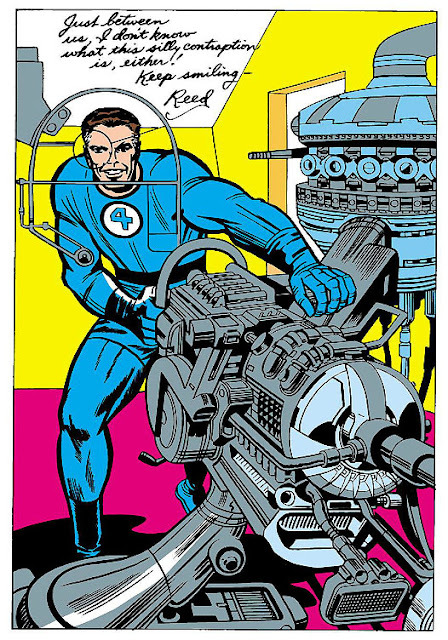 When Doom appears at the door, Reed tries to point out a few mathematical errors, but the arrogant Doom banishes Reed from his room, and goes on to try the experiment anyway. The machine explodes, of course, disfiguring Doom's face and causing his expulsion. Subsequently turning his back on the world, he goes into seclusion, tracking down and then training with a hidden group of secret Tibetan monks. At the end of this time, he has them create for him an ominous suit of armor and mask ... and thus garbed, ready to finally take his leave and return to the world, Doctor Doom is born. his second appearance. It's a great scene anyway. This being the first time we've encountered Doom's full origin, we can talk about the several theories which have arisen regarding the initial accident, and the status of Doom's face. As presented here, Doom is said to be horribly scarred in the explosion, which is why he had to go into hiding; that's certainly the impression Stan's dialogue presents. 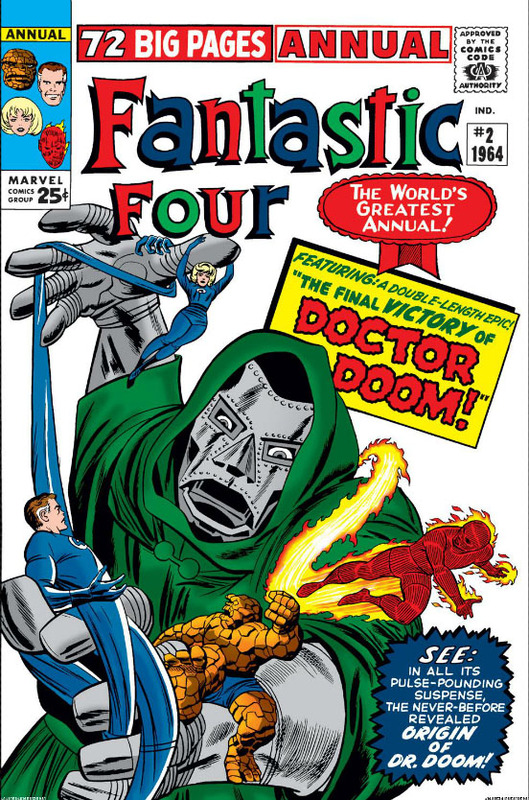 However, Jack Kirby would later express his own theory that the explosion only gave him a very slight scar - but that the unyielding Von Doom, witnessing his own perfect beauty ruined, thus declared himself unfit to be seen by the world. In a later story which some have questioned - but I actually find quite satisfying - writer/artist John Byrne would try to marry these two opposing viewpoints by indicating that the initial scarring was minimal ... until Doom instructed the monks to set the iron mask upon his face while it was still red-hot. (Note how even in this issue Kirby draws the mask being set on Doom's face as it still gives off clouds of steam.) This idea seems to me a very rich combination of the vanity and perfectionism found in Kirby's theory, while making Doom's accident the result of his pride - the very Shakespearean flaw favored by Lee - not just once, as originally portrayed, but in fact twice over. Silly is definitely the word for this! The main story opens with a very pedestrian occasion, as Ben loses control of the Fantasticar and is forced to bring them in for a rough landing on the Manhattan streets, rear-ending a civilian's automobile in the process. As might happen with any accident, the out-of-town owner jumps out of the car and starts laying into the Thing, yelling about damages and remuneration and the like. Up walks another man, however, introducing himself as an art dealer and offering to buy it from the driver on the spot. As soon as the cash trades hands, he asks the Thing to bust up the auto even more, claiming he'll sell it as an original "Clobber Creation!" It's a pretty funny way to kick off the tale, illustrating the impressive mixture of character realism and delightful absurdity that's made The Fantastic Four such a hit. through the crowd" thing, doesn't he? The time logic gets even weirder, in fact. 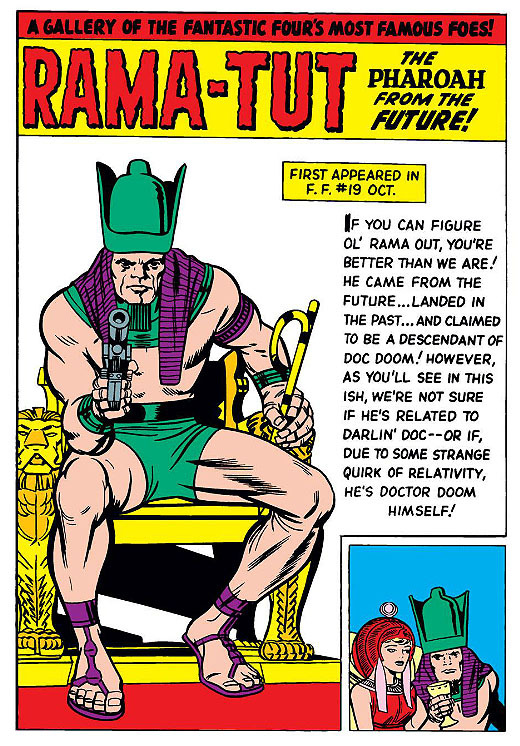 Rama-Tut suggests that the two of them team up to take down the FF, which has now defeated them both, but Doom says that they can't attack together - because if they're the same person, and the younger version is slain, the older version will die too. So Rama-Tut instead just drops Doom back on Earth, to pursue their vendetta on his own, and goes to live his conquering life back in the 25th century. It's a bizarre, bizarre development that doesn't really go anywhere, and doesn't answer the Doom-Pharaoh question that was first poised back in #19 ... so you have to wonder what the point was in bringing these two together in the first place. Did Stan have a plan, and first wanted to remind readers of the question? (Unlikely, given his usual, improvisational working method.) Or was it just a flashy, if convoluted, way to rescue Doom and get him back on Earth? As the plot gets underway, our heroes receive an invitation to a gala at the Latverian embassy, honoring them with a scientific fellowship. And yet none of them so much as bats an eye or sees anything suspicious, which I found odd. A few panels later we see them at the event, where Sue comments, "Reed, I'm rusty on my current events! Who is the actual ruler of Latveria?" And suddenly, with a shock, I realized: This annual was the first time Latveria had ever been seen! (For all we know, Doom's previous castle may have been located in upstate New York.) Doom and Latveria have been so completely connected in readers' minds ever since - the land can be said to be an intrinsic part of his character - that I had entirely forgotten the fact that we'd never seen or heard it before now. Hey, look! It's that bizarre limitation on Sue's powers! 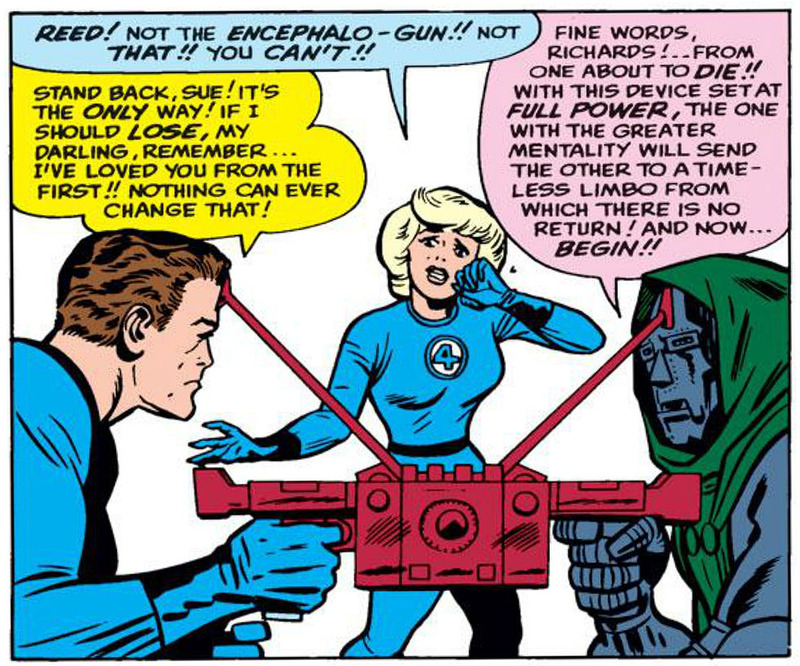 When the Fantastic Four's drinks are drugged at the embassy, they quickly hallucinate and turn on each other before discovering Doom as the culprit. Reed then leads them back home to the Baxter Building, where Doctor Doom awaits for their final confrontation. Wanting to put an end to Doom's madness once and for all, Mr. Fantastic whips out the most INSANE device imaginable: The encephalo-gun! This device, we're told, pits two combatants' willpowers against each other, and whoever loses ... is sent away to a timeless limbo forevermore. The idea that Reed would have invented something SO outlandish, and yet so ruthless, seems completely unbelievable ... until we're subsequently shocked to see Doctor Doom win the battle of wills, gloat over Reed's disappearing form, and then walk away satisfied. 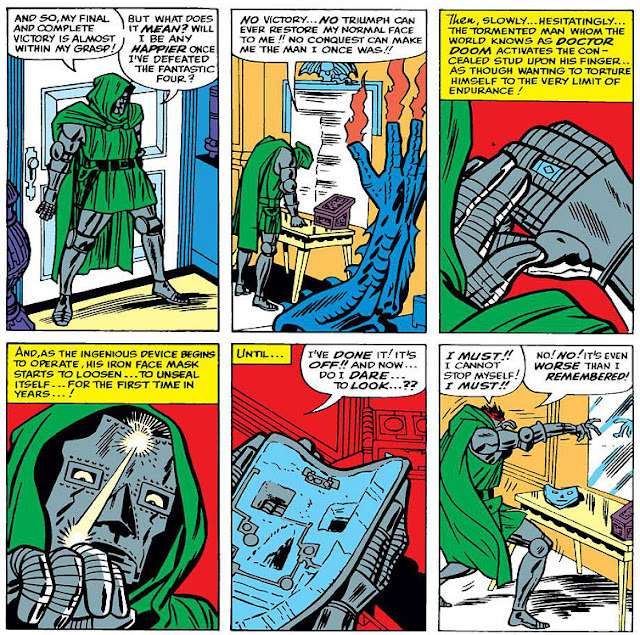 Sue is quite confused at Doom's actions, and asks Reed for an explanation - now seen casually leaning against the door - who points out that the gentleman's toast which Reed offered Doom before their duel was spiked with the same drug that had been used against them earlier that night, causing Doom to merely imagine his final victory against his foe. Now, what I find fascinating here is that apparently some readers have interpreted this to mean that it was only the victory itself which was imagined, and that everything up to that point was real. I think this misses the point: Everything that occurs after Reed & Doom drink was entirely imagined, up until we see Reed explaining the plan to Sue. I mean, something called "the encephalo-gun"? With that insane of a premise, and with such an iconic-yet-ludicrous visual design? In such a case, the revelation that it was all just a trick actually works because of the excesses in Lee's words and Kirby's designs, rather than in spite of them. 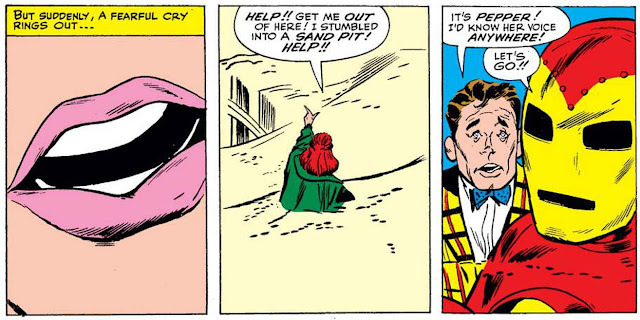 Heck, even Sue's melodramatic outburst makes sense in retrospect: "Reed! Not the encephalo-gun!! Not that!! You can't!!" Exactly the kind of over-the-top histrionics a megalomaniac would imagine his cowed foes shrieking, don't you think?